What Are You Waiting for? Shift Your Business to an Online and Get the Freedom to Do Your Work from ANYWHERE! Escaping to warmer climates during the winter? Living for a few months in your favorite destination? An extended visit to spend time with family? Or just lounging in your home office in pyjamas? Whichever it is, the key to your freedom is in your hands. I would't know where to start to create an online business. What if there were a way for you to go where you want—when you want—and take your business with you? If you're like me, you've got big dreams for your life. You feel passionate about your work and want to share it with others, and you're not afraid of the work it takes to get there. AND you long for travel experiences that make you feel ALIVE, that unleash your spirit! All too often, those dreams fall by the wayside as you get mired in the day-to-day details of running your business in the same way, in the same place you always have. You don't feel your business will ALLOW you to make extended trips to other parts of the world because it's not set up to make money online. It doesn't have to be that way. You can travel AND run your business, travel and even GROW your business, if you want! I know because I've done it myself. 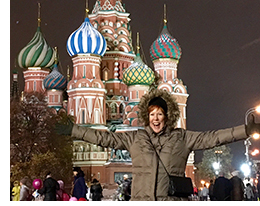 While traveling and living abroad extensively, I've built a business that I can run WHILE spending months at a time in my favorite place, Italy, or learning tango in Argentina, or exploring history in Russia. I do ALL of that—which FEEDS MY SOUL so much!—without missing a beat in my business. I've put together the On the Road & Making Money program to help you realize your dreams—not in 5 years...if ever...but starting NOW. I hope you'll join today and get on the path to your own journey of a lifetime in 2018! 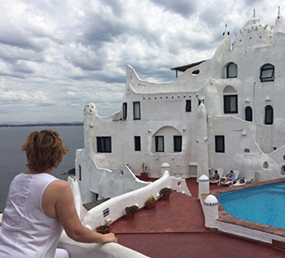 The On the Road & Making Money program is your next step...and the beginning of your travel dreams come true! Whatever it is, with On the Road & Making Money, you'll get to realize the benefit of specific, personal mentoring from an internationally recognized online marketing expert who knows firsthand what it takes to go on the road with your business. Creating an online business was pretty much a hope and a dream. Now I have more confidence than ever before because I have the road map and the tools to move forward. I am totally clear on my ideal client. I have learned how to do transformative conversations with prospects, and I'm learning how to build my list and do a lot of other things I always wondered about but didn't know how to implement. "The Experience Changed Me and It Changed My Business!" Linda's program showed up on my radar at just the right time. I knew I needed to come at my business differently in order to grow and even though it was a big gulp investment, it was so worth it. I learned so much about growing my online business and blasted through a number of limiting assumptions. The experience changed me and it changed my business. I've continued to use and build on everything I learned from Linda!! Get On the Road & Making Money now and let's make your dream happen...TODAY, not someday. 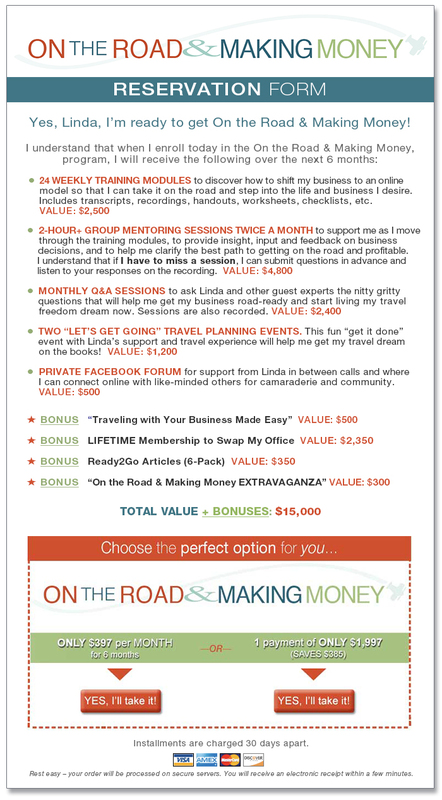 The "On the Road & Making Money" program covers everything you need to get your business online and your body on the road, in 24 practical, digestible modules, plus handouts, worksheets and transcripts. The course takes you through a step-by-step model that paces your learning and allows you to move ahead confidently while staying out of overwhelm. Modules cover every important component of creating a thriving business you can run from anywhere with just a laptop and a phone. If your business is already set up to be run online, this course will help you get FAR better results from your efforts. 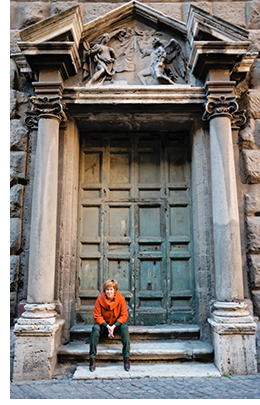 This course contains all of Linda's best practical and logistical tips for traveling with your business, harvested from her own YEARS of experience doing just that. It covers research & planning secrets, essential business technology, computer and business security, creating a vibrant social life abroad, staying safe and healthy...and much more! This is an essential companion course to "On the Road & Making Money" (which focuses on shifting your business online), and you get it at no additional cost! 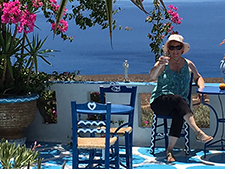 "On the Road & Making Money EXTRAVAGANZA"
Gain precious insights and valuable tips from 20 business owners who travel with their business that Linda has interviewed. Available as audio recordings or transcripts. Hearing the stories of other people who run their business while traveling is SO inspiring. They'll further motivate you and remind you how possible it all is! "I Love It! I Want to Join. What's the Investment?" Past clients are often surprised at how much they get for their investment in my program. Understandably so. Many coaches charge a great deal more for just a few coaching sessions. Yet with the On the Road & Making Money program, you get a comprehensive 24-module online business-building course, individual mentoring in a group setting (12 sessions), monthly Q&A sessions (guest experts + another opportunity for mentoring), 2 "Let's Get Going" virtual planning get-it-done sessions, and a private Facebook group for feedback between calls and a great community of like-minded, travel-loving solopreneurs. That's in addition to the bonuses—Traveling with Your Business Made Easy, lifetime membership in SwapMyOffice.com, Ready2Go Articles and the entire series of "On the Road & Making Money EXTRAVAGANZA" interviews. Total value of all the support you receive is $15,000. For an investment of only $397/month for 6 months. Or 1 payment of $1,997, saving you $385. One new client, or multiple clients enrolling in a new program you create, could MORE THAN pay for the On the Road & Making Money program! Join the On the Road & Making Money program to reignite that spark in YOU that sparkles out into the universe. Let's light up this world! 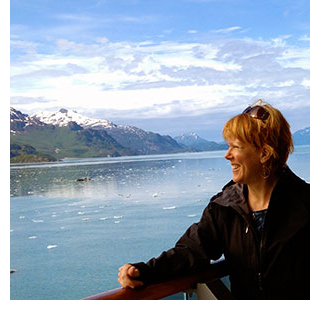 "Her Training Materials Are Second to None"
Linda is a gifted coach and instructor and her business acumen and sense of adventure are very inspiring. Her training materials are second to none and they have given me everything I need to move forward with a very strong foundation. It is wonderful to have all the valuable information, instructions and templates at my fingertips. Now that I don't have to spend time reinventing the wheel, I am able to move forward with excitement and ease. Click here to email Linda any question you have about the On the Road & Making Money. She will respond to you personally. ©2017 Claire Communications. All rights reserved. Questions? Email here.